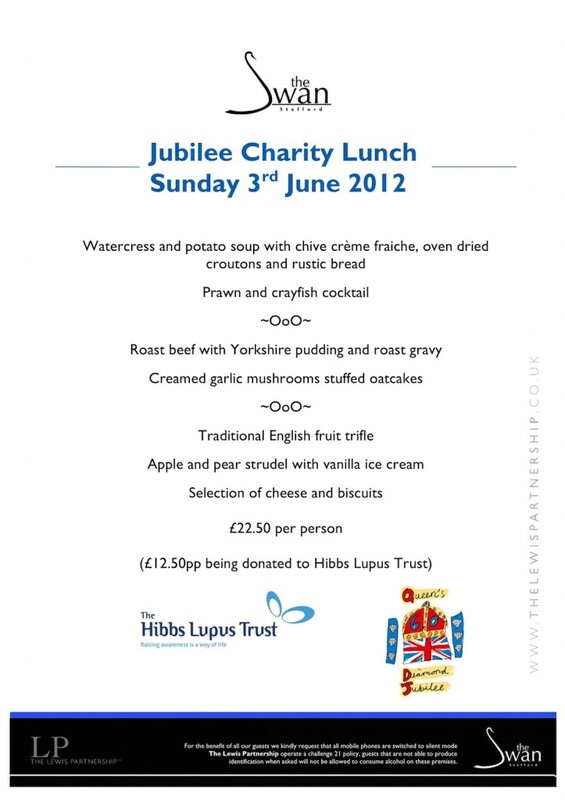 The Hibbs Lupus Trust is delighted to announce a fabulous Jubilee Charity Lunch at The Swan Stafford. A Bucks Fizz reception at 12:30 will be followed by a three course meal served at 13:30 on Sunday 3rd June 2012. With its relaxed atmosphere and attention to professional service, a warm family welcome awaits you at the award winning Swan Hotel. Located in the heart of Stafford’s shopping district, only a short walk from Stafford train station and a 5 minute drive from the M6, The Swan Hotel combines 18th Century history with 21st Century style. Call The Swan on 01785 258 142 to make your reservation.